Arunachal Governor and CM extended their best wishes to the people on occasion of Gandhi Jayanti, birth anniversary of the Father of the nation. The Governor of Arunachal Pradesh Brig. (Dr.) B.D. Mishra (Retd.) 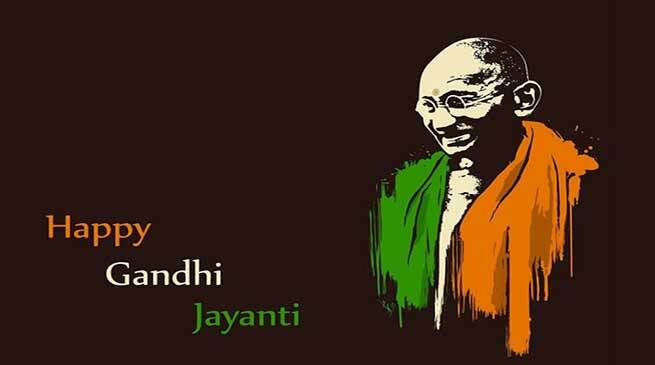 has extended his greetings and good wishes to the people of the State on the occasion of Gandhi Jayanti. In his message, the Governor said that Gandhi Jayanti reminds us to rededicate ourselves towards promoting amity, peace, and tolerance. It also motivates us to work enthusiastically for the progress of the nation. He expressed his hope that the occasion will inspire all to follow Gandhiji’s path of truth and non-violence. The Governor further said that Mahatma Gandhi dedicated his entire life for the cause of the downtrodden, deprived and the oppressed sections of the society. He tirelessly worked for strengthening communal harmony and integration. Today, Gandhi ji, is synonyms to peace and cleanliness in the mind of every citizen of India. Let us, on this momentous day, take a pledge and resolve to work for promoting peace and ensuring all pervasive justice. In pursuit of Gandhi ji’s ideals, let us also dedicate ourselves to cleanliness and up gradation of the environment. Our cherished goal should be to leave this Planet for our posterity in better shape and shade than what we have now, the Governor exhorted. May this Gandhi Jayanti promote the spirit of truth and Ahimsa (non-violence) the world over, the Governor wished. In a message this evening, Chief Minister Pema Khandu emphasized on the teachings of the Mahatma, which are relevant for all times. “Gandhiji’s teachings on non-violence will always be relevant. However, at times when we are everyday splashed with news reports of violence from various parts of the country and the world his teachings attain supreme significance. Violence of any form and hatred of any degree are best avoided for a peaceful and progressive society,” he observed. Paying rich tributes to the Mahatma, Khandu urged all, especially leaders to take a cue from the great soul, who practiced what he preached. “Mahatma Gandhi not only preached love and non-violence but he practiced it. He must be the only one in the world who led a nation to freedom without ever picking up arms,” Khandu pointed. The Chief Minister expressed optimism that while celebrating the day people would re-think on the amount of violence being perpetrated world-over and re-discover the power of love and non-violence. Khandu also appealed the citizens to join hands with the nation in celebrating Swacch Bharat Mission, a cleanliness movement started by Prime Minister Narendra Modi which has changed the face of the nation. He sought support of each and every citizen of the state to make this mission a grand success by actively participating in the cleanliness drives. “Lets adopt “Swachhta hi Sewa” to keep Arunachal clean and free of diseases” called Chief Minister.